For companies who are focused on providing services rather than products, image and identity remains key in establishing and enhancing brand identity and awareness. We have also helped many consulting and professional services companies find their way on the Web. Companies that provide consulting for the high tech, training, medical and human resource fields have all benefited from a low cost yet very effective web site design. 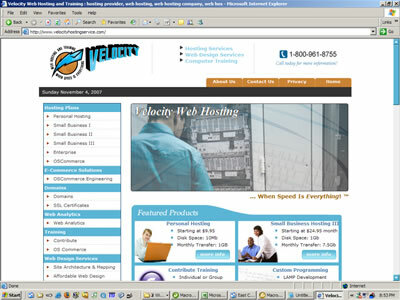 Velocity is partnered with one of the largest IBX™ (Internet Business Exchange) server hubs in the world. Providing speed, reliability and consistent uptimes, we helped with their overall branding and design.